FliC with B0032 and B0034 RBS under the control of J23100 promoter. This composite part was made by inserting a synthesised double-stranded oligonucleotide containing J23100 promoter (strong) and B0032 into K1463601 (fliC and B0034 RBS). As shown in Figure 1D, this construct in pSB1C3 failed to restore swimming in knockout fliC strains. On sequencing we found this plasmid to have a mutation in the promoter, explaining this result. We failed to clone a functional J23100 promoter in front of the fliC biobrick, suggesting that strong over expression of fliC may be toxic. 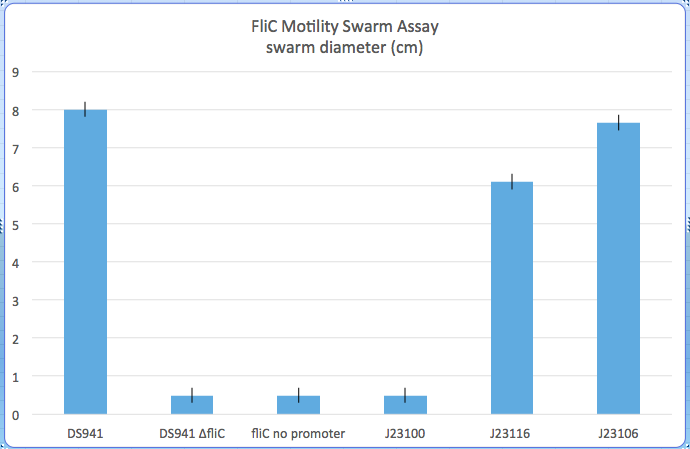 Figure 1: FliC Swarm Motility Assays. Figure 2 - FliC Motility Histogram The promoters indicated in the histogram were used to drive the fliC biobrick K1463600 with the RBS B0034. 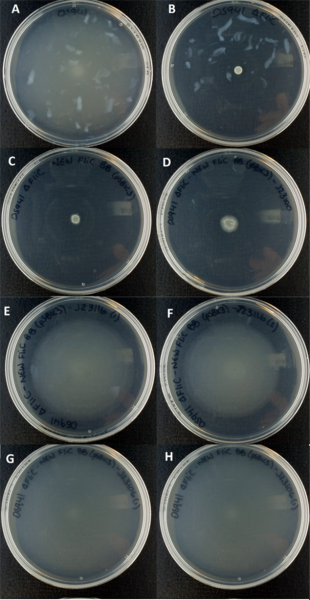 Plasmids containing these constructs were used to complement a chromosomal fliC mutation. The diameter of swimming in a 16 hour swarm assay at 37 degrees is shown. The error bars indicate the range or results obtained in two repeats of the experiment. The strong J23100 promoter in this result contained a mutation rendering it inactive see K1463604. This biobrick has been improved by the Aix-Marseille 2016 team. This biobrick, designed by Glasgow team, was not able to restore swimming this was because of a mutation in the promoter. Instead of Bba_J23100 with a mutation and Bba_J23116, we used this strong promoter, strong RBS combination for high expression levels of the flagellin coupled to a RBS, without mutation. We constructed this biobrick using Bba_K880005 (containing the promoter RBS combination) and Bba_K1951005 (our flagellin coding sequence). When testing our part we showed high level expression of functional Flagellin.